Where has the time gone? We’re already nearly a quarter of the way through 2018, a year when we hope to bring happiness to more families who are having a tough time living with serious illness and bereavement. Here’s the last few months’ round-up of how we’ve been going about making that possible, who has been helping us, and the latest fundraising events we’re lining up for the coming months. First, here’s a heart-warming story about a Memory Making holidaymaker who became a major fundraiser. A man who came with his family on a holiday found the experience so uplifting that he put THHN forward as his workplace Charity of the Year. 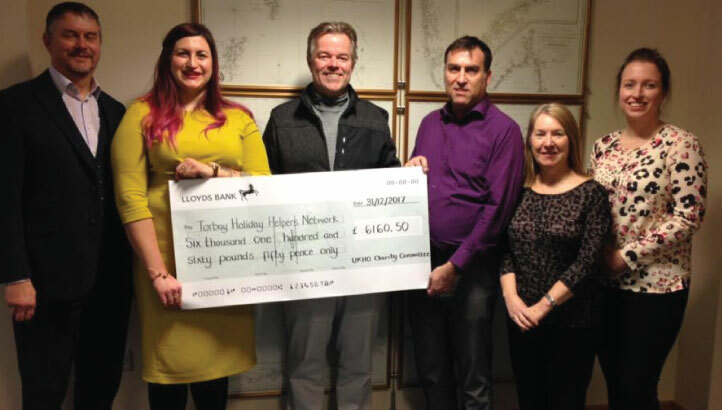 The company, UK Hydrographic, raised a spectacular £6,160.50 for us! Thank you UK Hydrographic, and thank you all the businesses, volunteers and fund raisers who have made and are making these special holidays possible. Now this money will help countless families in the future, triggered from one in the past. One of our amazing fundraising supporters is taking on a new challenge to help families living with serious illness and bereavement. Fantastic Yasemin has in the past taken on several running challenges for THHN, including taking part in the Amsterdam Marathon, which was her biggest so far. Now on Saturday 25th March she is aiming to swim 5,000m (just over 3 miles) non-stop at Swim Torquay. Chris Billing, a member of Torbay Athletic Club and the manager of On The Waterfront Restaurant is taking on the London Marathon in April to raise money for THHN. 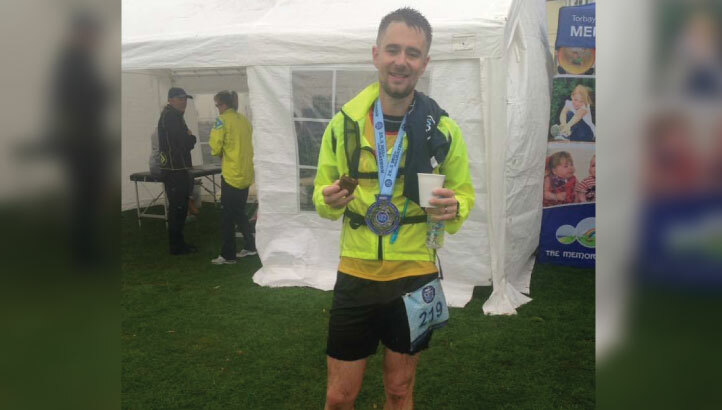 Last September he tackled the THHN City to Sea Marathon and enjoyed the experience. This year he has his sights set on a personal best at London. Would you like to take on a challenge for THHN in Devon in 2018? Torbay Half Marathon, Schools Challenge and Memory Maker Fun Run on Sunday, 24th June. Why not be a part of Team THHN and run the Torbay Half Marathon? Meanwhile, for schoolchildren aged 4 to 11 the Schools Challenge returns and we also have the one-mile Memory Maker Fun Run. Email brian@thhn.co.uk for details. 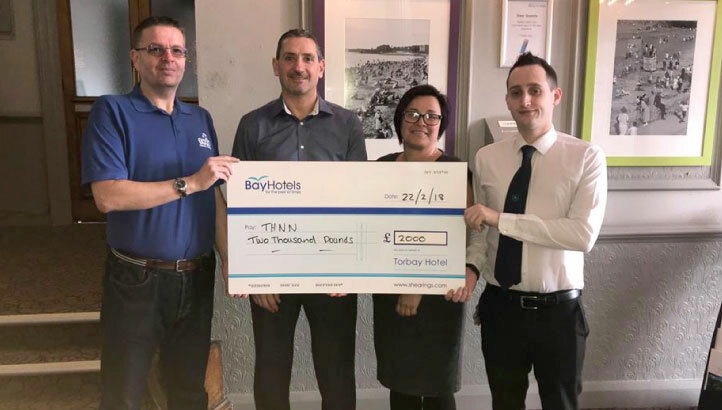 THHN Fundraising Manager, Brian Lewis had the great pleasure of attending a cheque presentation at the Bay Torbay Hotel, to receive a cheque for £2,000 raised by the staff and guests in 2017. He was delighted to be presented with the cheque by manager Simon Murray, along with Nicola Cousins and Aaron Hope. We would like to say a massive thank you to all the staff and guests at the Bay Torbay Hotel, who have supported THHN over many years. A very big thank you to Torquay Fire Station and the Run Torbay running group, who held a family day at Torquay Fire Station recently and raised £75.81 for THHN. Torquay Fire Station invited Run Torbay members to bring their families along to the Fire Station, to have a look around, learn all about the Fire Service and enjoy some refreshments laid on by Run Torbay leaders and members. The money raised will help give more memory-making holidays to families living with serious illness and bereavement. For the third year running, the Zest Restaurant at Hoopers Store in Torquay held their fantastic Breakfast with Santa. As with previous years, all proceeds of 2017’s festive event, held on Sunday 10 December, go to THHN. A big thank you to all at Hoopers for supporting us once again. We’re also extremely grateful to Matthew Day and the Barnabas Sports Trust for choosing THHN as the charity to benefit from the Cockington Christmas Caper again in 2017. The event was a huge success. As well as giving THHN ten charity places at the event, held on 9 December, £1 from every entry was donated to us. So far, £428 has so far been raised from the event. A massive thank you too to the fantastic team from Essential Chiropractic, who took donations in exchange for post-race massages. And lastly, thank you and big respect to Team THHN charity runners Paul, Lisa, Anita, Laura, Dean, Jodie, Brian, Dan and Jesse for taking on the tough 7.5-mile trail race. We would like to thank all the amazing supporting businesses that help THHN give families living with serious illness and bereavement memory-making holidays. Over the last few months we have had families staying free at Brunel Manor, Marine Hotel Paignton, Vomero Holiday Apartments, Little Greenway, Glendower B&B, Buckfast Abbey, Atlantis Holiday Apartments, Pilgrims Rest Cottages, and we have also welcomed families to stay in our Memory Maker Caravan at Finlake Holiday Park. Without the support of the very kind businesses we would not be able to help as many families as we do each year. The families on holiday have the opportunity to enjoy lots of amazing offers from other businesses and tourist attractions. We would also like to a say a very big thank you to all of them. They have made the families’ holidays extra special and given them memories they will treasure forever. At the time of writing, four more families were booked into the holiday home at Finlake for March/April, and volunteer holiday liaison officer Annemarie was responding to 2-3 new referee enquiries every week, so we are anticipating another busy season. Thank you to all our volunteers and business supporters who help us give families living with serious illness and bereavement, memory making holidays; you are all “Memory Makers”. 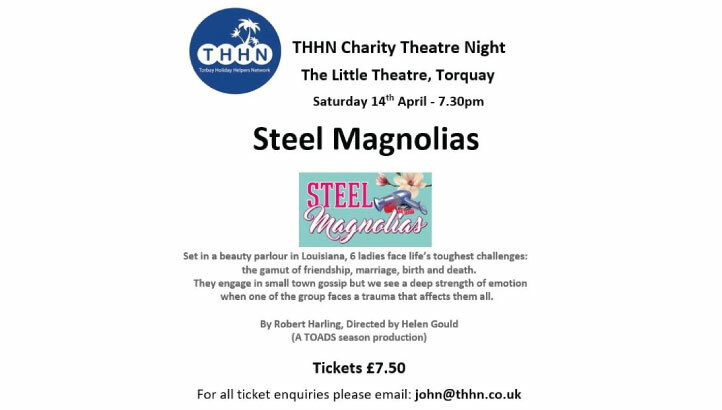 On Saturday 14th April at the Little Theatre in Torquay, there is a charity viewing of the latest TOADS production of Steel Magnolias. Why not get a group of friends or family members together, enjoy the play and help raise money for Torbay Holiday Helpers Network? All the money raised from the ticket sales for this charity viewing come direct to THHN. We have big plans for 2018 and by attending this charity viewing, you will help raise money to help us achieve these plans, which means we can help even more families living with serious illness and bereavement each year. 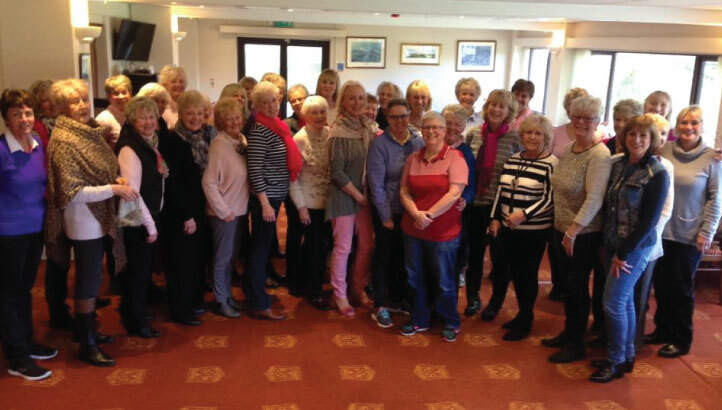 The new ladies’ captain at Torquay Golf Club, Marilyn Firkin, has made THHN her charity of the year. After finding out who they were fundraising for, she was impressed with the cause and decided that the ladies will be raising money for THHN throughout 2018.